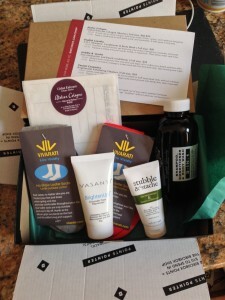 As some of you know – I get the monthly Birchbox for me delivery – This month came with samples of Atelier Cologne (you know thats going to the office for the boys) , English Laundry Shampoo and body wash, Stubble & ‘Stache face moisturizer and beard conditioner , Vasanti Brighten Up cleaners and Vivarati no show loafer socks! Im still working my way through last months box -but at first glance the Stubble & ‘Stache face moisturizer and beard condition will be up to test soon, the other products will go on the vacation dopp kit for when I travel. All and all having the Birchbox account has gotten be some great deals, good discounts and nice products I wouldn’t have found otherwise. 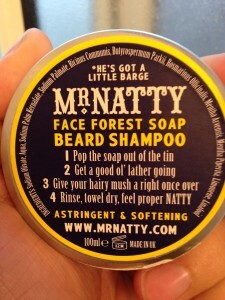 My fav this month is the Mr. Natty FFS (Face Forest Beard Soap) its got a great smell that is forest based with its blend of rosemary and English mint, which act as an aromatic wake-up call, with out being over bearing and dissipates soon after. But I love how it leaves my beard and the feeling of my face under all that hair. 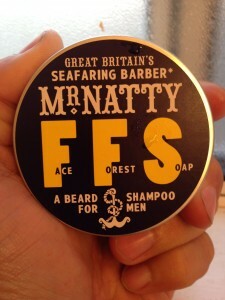 It max a mild astringent quality that I find I was looking for.